There are quite a lot of flags in Syria: not only on official buildings you always find the national flag and mostly the Ba'ath Party flag, but also on private buildings. In the Suqs there are lines with many little flags, often alternating the national flag and the Ba'ath Party flag. 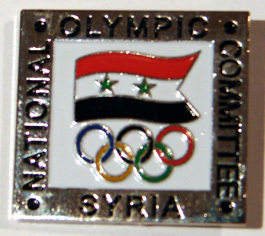 However, there are certainly some regional differences: In Damascus you see a lot of flags, also in the Suq; in the second-largest city, Aleppo, there are no flags in the Suq, but there are Islamic writings (for example the Shahada, as in the Saudi flag) hanging from the lines just as the little flags in the Damascus Suq; in Homs you can see the little triangular flags; in the parts along the Euphrates, for example near Der-ez-Zor, I saw some national flags without stars. However, there seem to be no regional flags or city flags. For Syria: PMS 032 red, 355 green and black. The vertical flag is simply the horizontal version turned 90 degrees clockwise. Red symbolizes the struggle and sacrifice for freedom; white signifies peace; and black stands for the dark colonial past. Besides the normal horizontal usage of the flag you can see it displayed vertically as well, be it painted on a wall or hanging on a building. The vertical examples are usually quite long (proportions from 3:1 up to 8:1). The national flag of Syria, as we know, is shown in a lot of different variants in Syria. There are four main variables in which individual flags can differ from one another. As a Syrian, please allow me to make a correction. The variation of the flag without the two stars does not exist; this would be the flag of Yemen. [During the 2005 Lebanon protests] I heard on the radio of a "Syrian flag with the Lebanese cedar added in the middle."